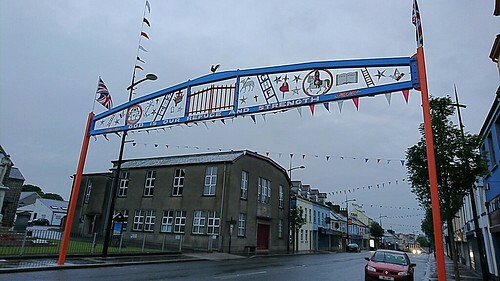 WE ARRIVED in Northern Ireland during Parade Season and every fourth town within easy driving distance has a parade on July 12th. While the drums beat, I spent part of a quiet morning looking out at part of the 350 acres that comprised RAF Greencastle, lands surrounding the cottage where we are staying. In the 1940s, heavy bombers lumbered overhead. Only a handful of the locals remember those WWII days. I think J. R. Walsh captures what I feel in his poem "No Weeping Now". I went back to the lonely Wolds, the fens and the empty sky. I saw the tall gaunt elms, heard the calling rooks, how time had passed me by. The dispersal points were empty, just starlings and grazing cows. For I'd said "I'll come back again". Then I thought, "What does it matter?" there is nobody here to care. Not a voice to break the silence, just the wind and the creaking doors. Or the whispering by scratch of a pen. So I stood quite still to listen; was there a message there for me? In the shadows would they remember, had they left me a sign to see? And I recalled all the purpose and courage, till my eyes were blurred by tears. Not the brave bold home of my memories; fool I was for the years had flown. +++ Photo of 5yo Dylan standing next to remnants of the chopped up main runway of RAF Greencastle. See more photos of the area in my Northern Ireland photo album.